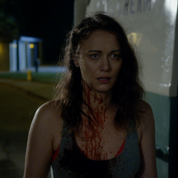 Marvelously fashioned and engrossing, writer-director Megan Freels Johnston’s sophomore feature, The Ice Cream Truck (2017), succeeds as both a character study and as a slasher saga. The eighty-seven-minute venture, produced by Look at Me Films, utilizes its title vehicle driving antagonist, The Ice Cream Man (in a devilishly divine turn from Emil Johnsen), just as triumphantly. This is as an extension of the underlying apprehension of moving and being accepted into a new neighborhood. Such is an affliction Freels Johnston’s likable and credibly-etched heroine, Mary (in a spectacular, layered portrayal from Deanna Russo), endures throughout the project. Yet, some of the best segments are the variety of quietly erected, darkly humorous touches. These play phenomenally well into Freels Johnston’s nightmare in suburbia scenario. Besides being stated outright on the eye-popping cover art for the affair, this notion is glimpsed in the anything but normal way Mary’s neighbors listen in on her conversations. This is as they obsessively tend to their yards. Moreover, it is illustrated in the fanatical manner that they always seem to be ever-inquisitive, intrusive even, about Mary’s personal life. What is just as absorbing is how the unfamiliar males Freels Johnston’s central figure encounters early on are menacingly presented. For instance, there is a first act arrangement involving a delivery man (in a solid representation from Jeff Daniel Phillips). In this configuration, Freels Johnston frames him in an unsettling veneer. This viewpoint is comparable to that which she later employs on The Ice Cream Man. Mary’s visible abhorrence reflects the aforesaid theme to mesmerizing consequence. It also serves as a splendid confirmation of the psychologically deft details of the demonstration. This is also a testament to Freels Johnston’s skill at generating suspense from otherwise mundane events. Such a high-caliber quality, a courtesy of Freels Johnston’s prowess as a literary and cinematic storyteller, resonates incredibly throughout the exertion. The Uncork’d Entertainment distribution release is certainly effective. It blends these above-mentioned items into an authentic atmosphere of dismay. The tone is equal doses John Carpenter’s Halloween (1978) and co-creators Mark Frost and David Lynch’s Twin Peaks (1990-1991, 2017-). There is even much of the internal mystery of Frost and Lynch’s program present in Freels Johnston’s outing. These related traits are treated and blended seamlessly. They are applied with prowess to tremendous import. The alignment to Carpenter is most evident in the engaging opening acknowledgments sequence. This is noteworthy when considering the general orchestration of the chronicle. Such is a facet that is rousingly carried throughout the depiction. This is also heard in Michael Boateng’s chill-inducing music. Freels Johnston’s composition concerns Mary, a struggling writer. She is settling into the previously addressed community. This is after her husband, Steve (Brett Johnston), is relocated. Such a sudden shuffle is due to the demands of his job. Arriving days before the rest of her family, who are back at her prior home concluding what business they need done before their departure, Mary tries to fit in with those that she now lives alongside. Yet, there is fear lurking in the shadows of these initially idealistic surroundings. It comes in the supposedly innocent form of The Ice Cream Man. Soon a trail of bodies become left in the wake of this murderous fiend. When Mary becomes his target, she must fight for survival. This is an intriguing concept for a labor of this ilk. Yet, what is just as interesting is the sub-plot of Mary’s attempts to recall her youth. These bits are focused on throughout the picture. These scenes work as engaging development. They add continued dimension to the lead. Such makes Mary and her plight relatable. Simultaneously, these ingredients also help Freels Johnston’s low-budget gem, whose brilliant script was a semi-finalist in the Circus Road Screenplay Competition, from becoming another assembly of tropes. For example, there are hardly any of the illogical actions or garden-variety stalk and chase moments routinely melded into these types of terror ventures. Still, the episodes of trepidation Freels Johnston evokes in the effort are appropriately tense and memorable. They are striking for their captivating build-up, execution and ultimate restraint. The satisfyingly lean climax is proof of the efficiency of the exploitation of this on-screen component. Such intricate structure is further elevated by Freels Johnston’s ear for realistic dialogue. It is also augmented by her ability to pull dread from a commonplace setting. Also assisting matters is Stephen Tringali’s remarkable cinematography. Likewise, Krista Speicher’s costume design is superb. Tony Urgo’s visual effects are masterful. Eric Potter’s editing is astonishing. The make-up, lighting, sound and visual effects are just as admirable. Correspondingly, John Redlinger is magnificent as Mary’s college age acquaintance, Max. Sam Schweikert as Nick, Hilary Barraford as Jessica and Bailey Anne Borders as Tracy are especially good. The same can be said of Dan Sutter’s turn as Frank and Dana Gaier’s performance of Brie. Freels Johnston, the granddaughter of popular crime novelist Elmore Leonard, has crafted an all-around superb undertaking. The pace is smart and pitch perfect. Similarly, it shares the reality-mirroring jolts that made Freels Johnston’s debut, Rebound (2014), terrific. The Ice Cream Truck also handles the subject of horror honed from social interaction. Such a topic was the concentration of Freels Johnston’s prior opus. The personalities that contact the protagonist of Freels Johnston’s latest may come across as archetypical. But, it is all part of the sharp sense of Mary’s perspective which gloriously courses through the piece. In turn, Freels Johnston has constructed a truly unique vision. Such is made increasingly envy-deriving when considering that it is orchestrated around everyday people and situations. Freels Johnston’s tale is intimate, immersive, dramatic and nail-biting. Her artistry is impeccable. Best of all, the movie never resorts to cheap shock tactics, such as an overreliance on jump scares or excessive gore, to glean intensity. The result is a photoplay that is consistently successful at evoking empathy and alarming audiences. This is a must-see. 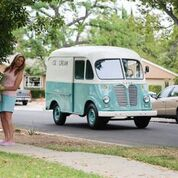 The Ice Cream Truck will be released in select theaters and on Video on Demand August 18th, 2017.